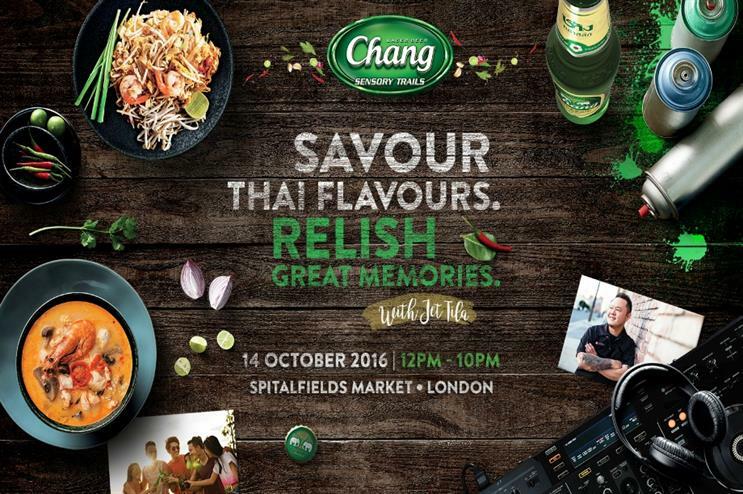 Thai beer brand Chang is bringing its Chang Sensory Trails World Tour to London, a multi-sensorial playground aimed at capturing memories around iconic Thai flavours. The trail, taking place at Spitalfields Market on 14 October, is coming to London after appearing in Singapore and LA and brings together live music, performance street art and Thai cuisine. The event will feature a partnership with London’s Thai restaurants, alongside celebrity chef and Thai culinary ambassador Jet Tila, who will curate a menu based on his personal memories. Music from Live Lounge and DJ Luke Sorensen and live street art from Squirl will also feature. The inaugural edition of the trail took place in Singapore on the 20 August, featuring Jet Tila and DJ Funk B, DJ Marvin Gold and Soul & Funk artist Russell Curtis. The Los Angeles event took place earlier this month, on 23 September. Chang Beer staged a Thai massage-themed event earlier this year at Westfield Stratford, implemented by AgencyUK. Thai beer Singha hosted a pop-up this summer, with the aim of transporting visitors to a classic Thai street bar, complete with eclectic decor, a golden sun deck and hanging chairs.